and HOPEFULLY it will grow into a quilt!!! and THOUGHT I'd be making a Bonnie Hunter design. I HAD to be DIFFERENT. 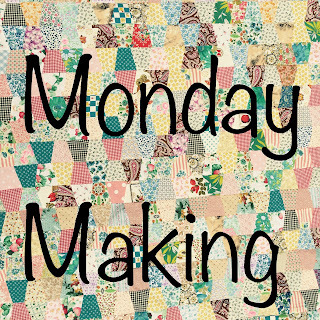 Your quilt idea is looking very lovely! What size are those little HSTs? those look great! I love the plaids and strips with the solid. Ooh, what fun! I still love your colors and color sense to the point of envy. Mine's getting turned into a wallhanging. I've been sewing strings for the border on and off for the last couple days. I like doing my thing too, much better. Love all those plaids! You got a good start on that next quilt. Your little blocks are WONDERFUL!!!!! I love your new blocks. The colors of the plaids are so enticing. And using the black as a contrast really makes a beautiful combination. Such pretty little blocks - so striking with the black! Can't wait to see how this one evolves. you are so fun! Love that you are different - and your blocks are great. That black is such a good punch in there. I love your combination of blocks, fabrics and colors! Great job! Thank you for hosting the party! I love the colors in this WIP. Especially the black!! These blocks are so cute! I think Bonnie would be the first to say, "Make it your way!"